The national average gasoline price for the holiday weekend is projected to be $2.21 gallon, the lowest since 2005, according to Gas Buddy, and the first time lower than on New Year's Day. "With 1.25 million more travelers than last year, 2017 will be marked as the most traveled Independence Day holiday weekend ever," reports the AAA. "37.5 million Americans will drive to their destinations, an increase of 2.9 percent over last year." The projection should not come as a surprise as the Federal Highway Administration issued a report in April showing that Americans set another record for vehicle miles traveled. Low gas prices are an ideal time to hike gas taxes, and seven states will do just that on July 1, mostly due to legislatures who had the ability to overcome significant political challenges. Indiana will see the largest increase of 9.9 cents per gallon while California and Maryland will adjust gas taxes upwards by 1.9 cents and 0.3 cents per gallon, respectively. South Carolina will implement the first two cents of a 12 cents per gallon increase that Republican Gov. Henry McMaster had vetoed, but was overridden by the Republican-controlled General Assembly. The Institute on Taxation and Economic Policy (ITEP) describes the details behind all the state gas tax changes that take effect July 1 in the first of three reports. 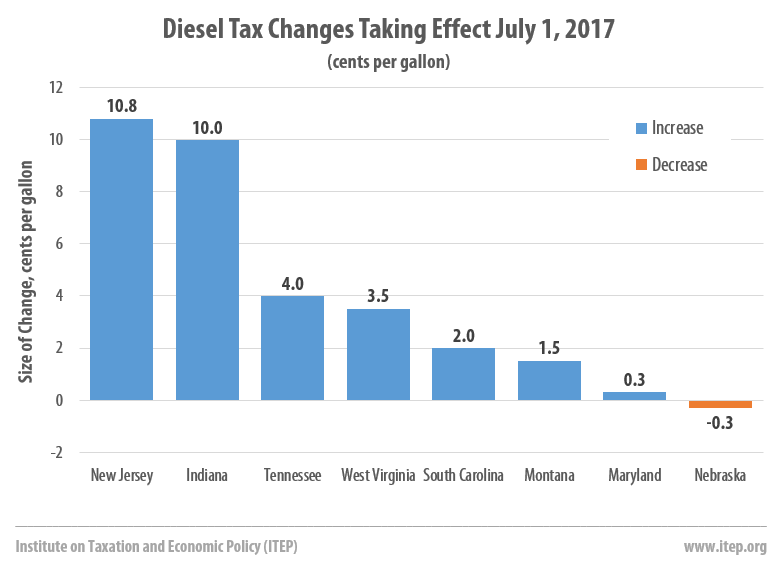 Click here for diesel tax changes on July 1. Thirteen states have gone two decades or more without a gas tax increase. Most Americans Live in States with Variable-Rate Gas Taxes: "Thirty states and the federal government levy fixed-rate gas taxes where the tax rate does not change even when the cost of infrastructure materials rises or when drivers transition toward more fuel-efficient vehicles and pay less in gas tax." Finally, Dug Begley, transportation writer for the Houston Chronicle, reports on new research published in the Journal of Public Economics [pdf] concluding that a "federal tax on vehicle miles traveled [VMT], as opposed to a per-gallon tax on gasoline, could raise money for the Highway Trust Fund and improve society, to the tune of a 20 percent increase in social welfare." The report indicates that a VMT fee would correct the funding problem created by the policy inconsistency of a stagnant federal gas tax, unchanged since 1993, and steadily increasing fuel economy standards, currently set at 54.5 mpg by 2025, though President Trump is trying to roll it back. A VMT tax has the potential to generate a more stable stream of revenues than a gasoline tax because motorists cannot reduce their tax burden by driving more fuel efficient vehicles. Hat tips to Carl Davis and Jenice Robinson, ITEP.